Christmas shopping can be a nightmare if you let it get the better of you! 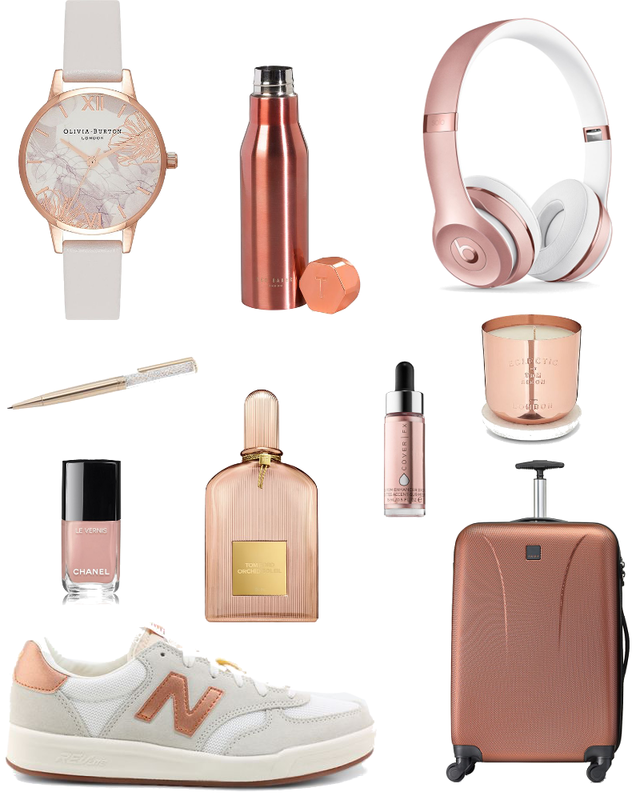 Hopefully, my gift guides part 1: Black and Gold Edition and part 2: Rose Gold Edition, provide some luxury gift inspiration for those of us that leave Christmas shopping to the last minute! Here's a further ten gift round up guaranteed to put a smile on any lady in your life's mouth! Watches are a perfect gift for a girl with everything. This stunning new watch from the brand favourite Olivia Burton mixing elegance with a touch of chic. I would recommend personalising the strap for an extra £30 to add a personal touch to this inexpensive but gorgeous gift. This beautiful simplistic designed AAKUA water bottle from Ted Baker is essential for those who are always on the go. A sleek stainless steel bottle with a hexagon-shaped lid, perfect for popping in your bag to stay hydrated in style. For the audio snobs out there you either love them or hate them and I have to say I love them! Not only does the sleek design look stunning, but they're also comfortable to wear, have an above-average sound quality, a great battery life, and excellent wireless range. Tell me what's not to love about this tech. A stunning gift idea! This refined and elegant ballpoint pen contains tiny delicate clear crystals, making this a thoughtful and pretty stocking filler. I cannot recommend CoverFX Enhance drops enough. This miracle drops of pure radiance, create such a gorgeous glow for the complexion and be mixed into foundation for an all-over glow or used as a strobe highlighter. These little drops of magic will make any makeup lovers day and why not add to your basket to create a little an Enhancer Kit. The cult classic 'London' copper encased candle, manages to capture the smell of red brick, London parks and the salty smell of the Thames. Fill your senses with the nostalgic homely scent this candle makes a UK expat filled with joy. Not exactly rose gold but this perfect pale pink blush shade 'Organdi' wonderfully compliments the strength of the rose gold shade. Chanel nail polishes are fantastic, and this reformulated Le Vernis formula means extended wear and better quality for the money. This perfume in an elegant fluted glass rose gold bottle, not only looks the part but smells divine too. This scent is a seductive warming smell, mixing floral, and spicy elements for a longlasting and sensual fragrance. Get ready for that new year's resolution and hit the gym in style! These gorgeous NB trainers are comfortable and stylish and can be worn as a fashion trainer and in front of a personal trainer! The rose gold addition makes these shoes pop against the off-white backdrop. My final pick is this beautiful hard suitcase, with January soon approaching, adventures will be on most of our new year resolution lists so this gorgeous case will make travelling in style a reality. Hope you liked my Luxury Gift guides including The Black & Gold Edition and gave you lots of inspiration. With now only a few Christmas shopping days remaining I recommend getting the Christmas shopping out of the way, so you can relax and enjoy the most magical time of the year at home! Have a very Merry Christmas lovelies and may you be very spoilt!